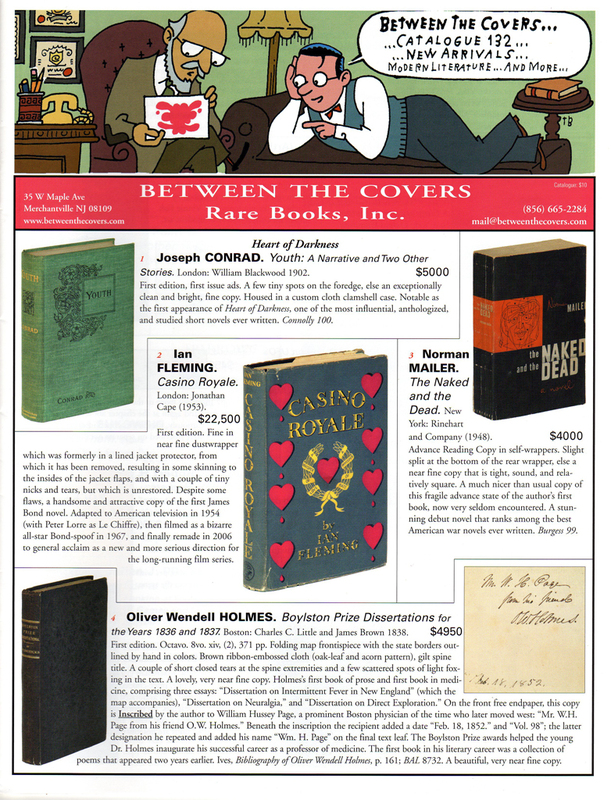 In my recent piece on the Baltimore Bookfair and elsewhere, I sang the praises of the Between the Covers web site. It is one of the most innovative on the Web. With his presence at all the major book fairs, in several bookseller associations and organizations, and in book magazines, Tom Congalton acts as the face of that operation, but he has a dedicated, fun-loving, and incredibly knowledgeable staff behind him. In terms of the web site, Dan Gregory is the one of the wizards behind the curtain that makes the site work so efficiently and effectively. Tom Bloom deserves special mention as well. Back in the mid-90s when I first started collecting, his artwork on the Between the Covers catalogs — as much as the books within them — made me eager to get my mail every day. To this day, despite a series of moves, I’ve kept all those catalogs. Gregory and I have emailed back and forth a few times and the subject of an interview on the Internet and the rare book trade came up. I was curious about the philosophies and day to day activities that made the site possible as well as what betweenthecovers.com means in terms of the past, present, and future of rare bookselling. Besides putting together a wonderful web site, Gregory has developed some interesting web tools that make buying books on the Internet a more personal and more intimate experience. For example, the rotating book technology (e.g. a rotating copy of Burroughs’ Junkie) has far-reaching implications for the development of virtual archives. Not surprisingly, Gregory possesses some interesting ideas and opinions about the relastionship between the Web and bookselling. What follows is the first part of what is shaping up to be a two part interview on the topic. You began working with Between the Covers in 1996. Did the bookstore consider itself a pioneer in cyberspace? What was the trade’s feeling towards the internet at the time? When Tom hired me he told me that he wanted to launch a web site of some kind, but he didn’t have very clear ideas. At that point at least several dozen very good dealers had sites, so we certainly weren’t pioneers. We launched our site in early 1997 and I think it was very solidly laid-out, so that we didn’t need to overhaul it for a good long time. I also gave a lot of thought to “what should this web site ‘be’? What should this web site ‘do’ for customers?” So in that sense perhaps we were pioneers because I think most dealers, then and now, don’t really put much effort into giving their web site a purpose. For many it is basically a business card, especially today — they have it because they would feel “unprofessional” without it. Most of the things in the 2006 version of the web site were things I wanted to do in the 1997 version, but at the time both we and the web weren’t ready (that is, neither 1997 software nor 1997 connection speeds would have allowed our current site to work for customers). As for the second part of the question, I think that in the late 1990s the segment of the book trade that I knew (mid- to high-end antiquarian dealers) was simultaneously optimistic and skeptical. They all understood something big was going on here, but they weren’t sure at the end of the day how it was going to affect their part of the book market. Ultimately I would say a considerable amount of dealing, particularly the really pricey stuff, still goes on outside the Internet. As happy as I am with our web site, and with the number of books we sell online through all our partner-venues, it is still only a fraction of our business. 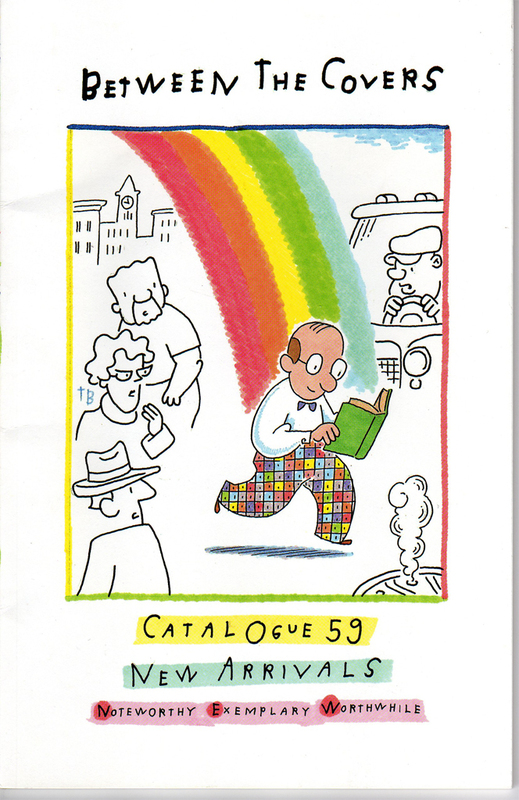 I started collecting in 1993 and Between the Covers had one of the most distinctive catalogs around with artwork by Tom Bloom. When you started was there a philosophy regarding the appearance of the web site such as trying to recreate the distinctive feel of the catalog or did that come later? With both our initial and our re-launched sites, I thought it was essential to use Tom Bloom’s work. I am a big believer in branding as one of the most important elements of a rare book business. And branding goes beyond a consistent logo or a consistent font (although that’s a good start). For me, branding is also about presenting a philosophy of business. The reason I like working with Tom Bloom so much, and Tom Congalton for that matter, is that it is very clear from both their artwork and their writing that we don’t take ourselves too seriously. We actually enjoy having and selling the books in our inventory. We’re having fun. We laugh a lot. Other businesses, particularly rare book businesses, are very buttoned-down. And there is nothing wrong with that. It works for them, and it works for their customers. To a degree very rare and valuable material lends itself to hushed tones and cloistered settings. But it’s not what we’re about, either in Tom Bloom’s artwork, in Tom Congalton’s catalog descriptions, or even in his choice of inventory. So for our first site, I used pre-existing Tom Bloom artwork and a very colorful palette to try to communicate that sense of fun. For our current site we got much more ambitious, and commissioned pages and pages of entirely new artwork for each “section” of the site. And of course we added animation and a sense of “depth” to the site in our layout. With the new site we were trying to recreate the experience of visiting our office or visiting our booth at a bookfair. As it stands right now, what are some of your major tenets regarding bookselling and the internet? I don’t think any of the elements that went into professional bookselling before the Internet have really changed or become minimized. The one major difference is the tremendous availability of books and book dealers. At the Colorado Antiquarian Book Seminars I urge new booksellers to identify WHAT KIND of professional bookseller they want to be. That is, are they naturally inclined toward research? Toward service? Toward competitive pricing? Booksellers need to figure out their own identity, and then communicate that identity to potential customers. You can do that in a limited fashion with your book descriptions, but obviously a web site allows for much more of that. Selling is much easier when your potential customers have the confidence that there is a real and distinct (and hopefully professional and likeable) person on the other end of the Ethernet cable. In the past couple of years we’ve seen many more bookseller blogs, and that is one of the easier ways for a bookseller to personalize the web experience for collectors. If you are a specialist dealer with unique or nearly unique knowledge, it’s much easier to carve a niche in the marketplace. Now I don’t have data on this, but I would hazard to guess that the percentage of dealers who would define themselves as specialist dealers, or as having genuinely specialized knowledge, against the full spectrum of sellers out there, has probably gone down dramatically over the last decade as the number of people selling books has skyrocketed. In other words, fifteen years ago perhaps 30 out of every hundred booksellers were specialists. Now perhaps the number is not more than 5 out of every hundred booksellers is a specialist. (Again, the numbers are purely speculation.) But, even in the absence of data, I believe for the vast majority of dealers now, there are hundreds of other dealers out there with similar experience selling similar material for similar prices. If you can’t stand out because of your inventory, then you have to try to stand out in other ways. And you MUST communicate to the potential buyer than there is a real, unique and interesting person at the other end of the transaction. The Between the Covers site must take a remarkable amount of work. Can you give some idea of the daily grind it takes to make the site work? If you can give some idea what are the economics that makes all that work and man hours worthwhile? Regarding the economics, our first site cost us almost nothing and so anything we sold would be considered a profit. One day a very wealthy person wanting to get a book for his son assigned his secretary to research rare books and she found our site. That resulted directly in a six figure sale, so when it came time to redesign I felt we could devote a lot more resources to it. Of course sometimes throwing money is not a good solution — most of the big book sites are very uninspired, and in some cases just a mess of jumbled data, despite their deep pockets. Specifically regarding the amount of work that goes into our site, it can be very hard to find time to add non-product data. That is, like all book dealers we are always adding books to our inventory database. And for many years we’ve had a picture for every book. So the books on our site are changing daily. And we built in programming to add a degree of randomness to every load of the home page — every visit gives you a unique initial set of books to view that will never be repeated. Coming from several years of managing brick and mortar stores, I was wary of what I call the “shop window roller coaster.” When you are first put in charge of a shop window you put a lot of effort into the display. Every element is carefully considered, every inch is an inspiration contributing to a thematic work of art. Then you unveil it, and maybe the customers respond, or maybe it falls kind of flat. Either way, in a few weeks you have to do it all over again. You pick another theme and set to work. After doing it a few times frankly you get pretty sick of the whole process: the fun has leached out of it like the colors of the books in the window that have been hit daily by the morning sun. It becomes a chore, and so the results suffer as the enthusiasm wanes. During our planning sessions there were several times when our designer said, “Let’s build it this way so you can change it as often as you wish.” My reply was often, “Let’s build it to change automatically, because otherwise I will never get to it.” We have a lot of algorithms designed to make the kinds of display choices we would make manually. But much of the content on the site, particularly all the bibliographic and unique content, has to be added by people. Adding articles and reference information isn’t normally part of our work schedule, so it can be tough to find the time. In the summer we usually hire students on their academic breaks, and so we get a lot of data typed in then. And we built the site to be very scalable, so there is infinite room for growth. When I get a chance, say when I’m in between catalogs, I’ll add photos from our archive, or add articles, or award lists, etc. Regarding profitability, our site is just one more “arrow in our quiver.” But in addition to the direct sales it generates, it also I think leads indirectly to a lot of business. More specifically, we make much more from our catalogs and direct quotes to customers. But about of a third of our Internet sales come through our web site, and of course we pay no commission or fees for those sales so they are also more profitable than our other Internet sales. And when people hear about us and look us up, I think it helps that they see a very deep site with a lot of information. Let’s talk about the current site. You provide a brief description of your thoughts behind the site such as the attempt to recreate the old cluttered brick-and-mortar bookshop in cyberspace. As a result your site is “busy” or “cluttered.” Has this been the major criticism of the site? Can you touch on how “busy” ties into the need for constant content on the internet? Actually that was only self-criticism — I’m happy to say that quite a few people have written in to say how much they like the structure and look of the site. Some of our more enthusiastic visitors have even posted messages along the lines of “Don’t change a thing!” The only major criticism we received when we launched the site was about the speed. It was pretty slow, especially compared to the normal expectations of page load these days. There is quite a lot going on “under the hood,” so the coding for each page is very complex. But we did a lot of recoding and indexing, and now I think the site speed is acceptable. We’ll try to get it even faster, but that was the main improvement we’ve made since we launched. Regarding the constant need for content, I’ve never understood why any bookseller would think that a collector would want to go to an individual dealer’s site if all that site had was a search engine no different than all the other book search engines out there. You have to give people reasons to visit. It’s not uncommon for us to have half hour or even hour long visits from web viewers, which I think is great. And happily those aren’t flukes. Our average visit is several minutes long. And we also see a lot of people going from one page to another, to another and only leaving the site after they’ve visited a half dozen or a dozen pages on it. I have faith that “stickiness” pays off, either directly or indirectly. I often think about the age of collectors. Your site seems to be perfect for younger, more computer-savvy collectors. Is this an effort to get in touch with and spark the interest of younger collectors? Is the print catalog in a similar way a means to keep in contact with your older, more traditional clientele? Actually both our site and our catalogs are based mostly on personal aesthetics. 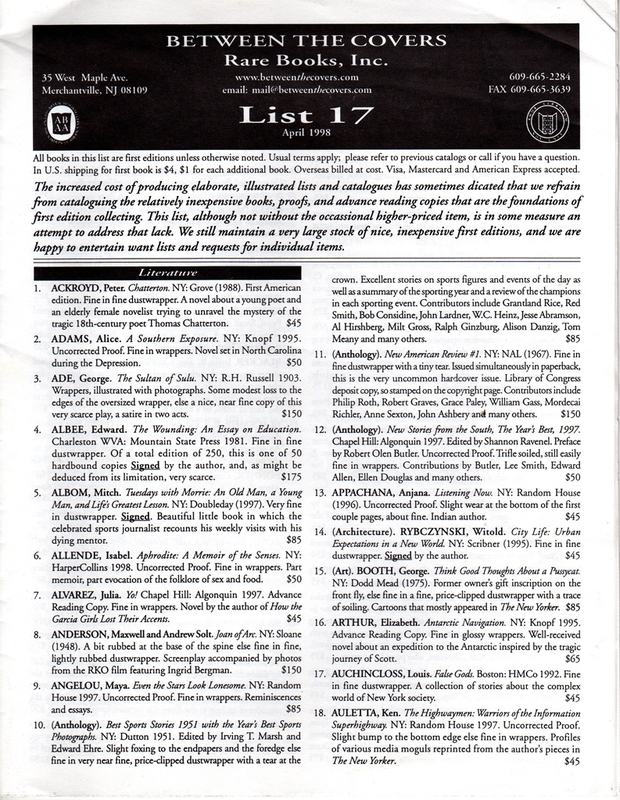 We try to make catalogs we would like to receive in the mail, and a web site we would like to visit. It’s partly selfish, partly a confidence in our own judgment, and partly a sensibility that there is no point in copying everything else out there, especially when, to be frank, so much of it is mediocre. To a large extent this philosophy comes from Tom Congalton and the way he buys books — he buys things that are interesting to him, taking a calculated risk that if he found it interesting our customers will as well. Early on when we were planning the redesign we were advised to survey web customers and we said, “Nah, we’ll just do it the way we like.” Surveys have their place, but it is also a quick path to mediocrity, especially when there is, I think, a dearth of originality and inspiration in the rare book trade. Some of our best web site customers are also our steady catalog customers, and they are mostly middle-aged. Since I know them and can see what they buy, I can assess that. But we haven’t bothered to survey our web visitors beyond that, so I don’t know if as a group they are younger than our catalog mailing list. Written by Jed Birmingham and published by RealityStudio on 13 October 2007. Many thanks to Dan Gregory and Between the Covers.